Airline stocks can’t seem to catch a break. The NYSE Arca Airline Index, which tracks U.S. and international carriers, lagged the broader market in 2018 — dropping nearly 21 percent compared with the S&P’s decline of more than 6 percent — and some of the biggest airlines are warning that 2019 might bring more bad news. American Airlines and Delta Air Lines both finished last week in the red after each carrier cut its guidance. This comes after American Airlines fell just more than 20 percent in December, its worst month on record. It’s plummeted more than 46 percent from its January 2018 high of $59.08. Some investors may view the move lower as an opportunity for bargain hunting, but BK Asset Management’s Boris Schlossberg believes we haven’t yet seen the worst. He believes that despite a drop in fuel costs, airlines’ inability to control pricing as well as a potential peak in demand will continue to pressure margins going forward. He also noted that the partial government shutdown, which reached 24 days on Monday and is the longest shutdown on record, isn’t good news for airlines. “Of course the shutdown is really not helping the airline industry … just the delays themselves are going to have a massive, massive ricochet effect through the whole industry,” he said. Like Schlossberg, Oppenheimer’s Ari Wald wouldn’t be buying airline stocks here. 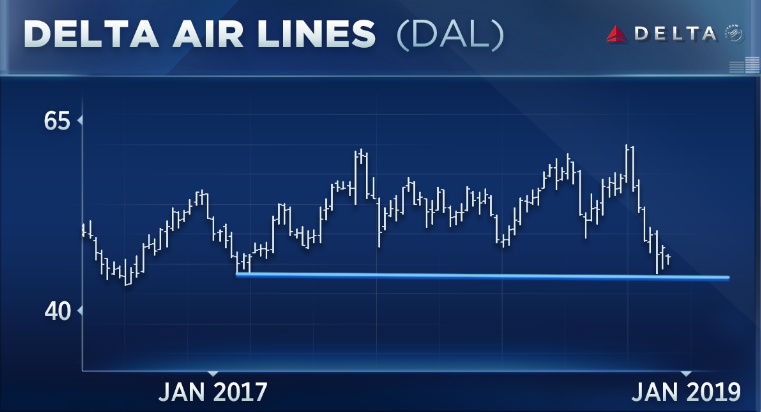 After examining the charts for Delta and United specifically, he isn’t convinced that either one is about to turn a corner or break out to the upside. That said, he is watching one key level for DAL. “Big support is $45. This is the multiyear low. We’ve bounced right from there. Positive above there, use that as your protective stop,” he said. Shares of Delta slid nearly 2 percent Monday after Bank of America cut the name to a neutral rating based on a lack of upcoming positive catalysts. The firm also lowered its price target to $51. The stock finished the day at $47.75, so it would need to fall another 5.7 percent to reach Wald’s $45 level.